Every barista will tell you: there’s little worse than the inevitable Starbucks nightmares. Mine started two weeks into my training. Not to be boastful, but I picked up the training very quickly in comparison to the usual course of Barista 101. I attribute this fact to my amazingly dedicated learning coach, and the fact that the whole store jumped whole-heartedly into my training. As a result, I struggled very little with the process. Except for those Caramel Macchiatos. I just couldn’t get them made correctly. This was ironic, because they have always been my favourite “go-to” drink. Lattes? Perfect. Cappuccinos? Foamy. Mochas? Well stirred. Americanos? Mellow. Caramel Macchiatos? Too heavy or too light. Arg! As my certification loomed, the nightmares started: night after night I dreamt that I was making a tall Caramel Macchiato, and that it wouldn’t turn out correctly. I’d make them over and over and over and over in my dreams. Even when I mastered the drink in real life, my early struggles would still haunt my dreams. Time and time again the customer would send their Caramel Macchiato back over the bar- too foamy, not sweet enough, too much milk, too much espresso…these nightmare customers were impossible to please. Finally, they stopped. For two years I’ve not dreamt about Starbucks at all. That is, until last night. I didn’t realize just how stressed I’ve been at work lately. Quasa is prowling around my district (for those of you unfamiliar with the company, imagine the harshest, meanest, most stringent health inspection you’ve ever heard of. Then quadruple it. That’s a general idea- it’s really terrifying. ), we just totally rearranged our frappuccino station for the millionth time, the new wifi standards have resulted in a full cafe almost all of our open hours, our 1,000 piece weekly roasting plant order is now coming on Friday afternoon instead of Wednesday morning, one of our espresso machines keeps breaking down, our fire exit light is out and they don’t consider fixing that a “priority”, our Siren Sign won’t turn off (which makes it look like we are open all night), we have two new partners in the store, our food and milk delivery comes while we are still open for business, and Simphony continues to kick us in the rear ends. Little things, but taken all together they are super stressful. I don’t remember much, but I do remember making frappuccinos on the hood of my car (please don’t ask). Much of the dream centered around unhappy customers, and my attempts to make them “enthusiastically satisfied.” The only thing worse than ornery customers in real life are those dream customers- you just can’t make them happy. In my dream, I was trapped at the bar for hour after hour making drinks, and not getting anything accomplished. Even my drinks were horrible. Silly non-real customers; not that my brain will accept that fact that they are figments of my own imagination…. I woke up as exhausted as if I had worked a six hour shift instead of sleeping safely in my bed for the past six hours. It’s just ridiculous! My first thought was to have some chamomile tea before bed to calm my brain…but wait! That reminds me of Starbucks. Warm milk? Nope, that brings work to mind as well. Listen to music? No, I’m always haunted by the incessant repetition of our HearNow music selections. So, I’m open to ideas! Send them my way! Okay, deep seriousity aside…I’ve got AWESOME news! You don’t know what I’m talking about? Isn’t it cute? 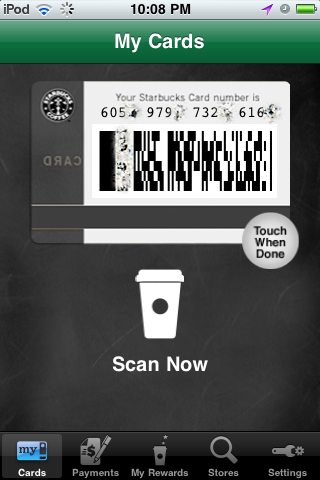 So, you download the app, and then sync it with your Starbucks.com account by signing in. You remember your username and password, right? Good! Sorry for the blurring, but I’ve got to protect my card! But you all get the idea. So, here’s how it works. 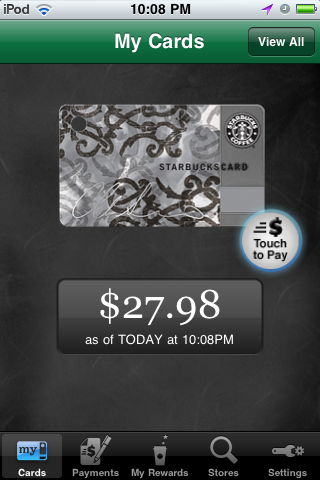 You walk into Starbucks, place your order, and tell the barista you will be paying with a Starbucks card. You can then hold your iPod/iPhone under the scanner. It will beep once, and you’ve paid! Hit the “Touch When Done” button, and it will ditch the barcode, give you your pretty card picture again, and automatically refresh your balance. 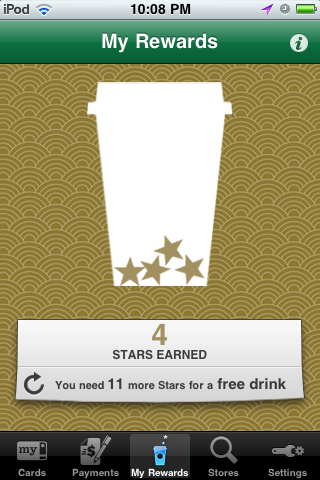 You can also see how many stars away you are from your next free drink! Is that cool or what?!?!?!?!? 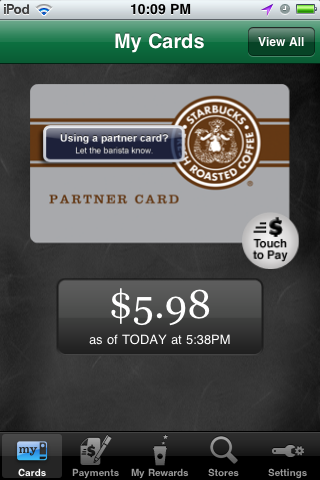 Oh, and partners, register your partner card. You can scan it for your discount! There you have it: nightmares and dreams come true all in the same week. Here’s hoping for a quiet week- both at work and in my dreams!